Entering the World of Prebiotics — Are They a Precursor to Good Gut Health? The subject of probiotics is familiar to most nutrition professionals. Research shows they play a key role in promoting good digestion, supporting the immune system, and helping to ameliorate irritable bowel syndrome (IBS) and diarrhea symptoms. Prebiotics, however, tend to be more of a mystery. The International Scientific Association for Probiotics and Prebiotics defines probiotics as live microorganisms that, when administered in adequate amounts, confer a health benefit on the host.1 The group defines prebiotics as a selectively fermented ingredient that results in specific changes in the composition and/or activity of the gastrointestinal microbiota, thus conferring benefit(s) upon host health.2 At the end of each of these definitions is the key: the host benefits. Prebiotics are probiotic promoters or the fuel for good bacteria, which help manipulate the microbiome to support gastrointestinal health. These benefits appear impressive, but prebiotics are still being studied, and some research remains inconclusive. Joanne Slavin, PhD, RD, a professor in the department of food science and nutrition at the University of Minnesota, says the research doesn't show strong associations between prebiotics and improved immune function. However, she believes studies do show that prebiotics promote satiety and reduce postprandial glucose and insulin levels. The Sanders study reported that much of the information available on microbiota-associated disorders remains associative, meaning that research hasn't yet proven that a particular shift in microbiota causes illness. Nevertheless, Slavin says the evidence is strong enough to recommend clients and patients modify their diets to promote a healthier microbiota through prebiotics. There's no consensus on what the exact composition of a healthy microbiota is, she says, but experts agree that a microbiota that produces SCFAs generally is better than a putrefactive one, in which food is broken down more slowly and without the production of health-producing compounds such as SCFAs. Prebiotics are the food components that help make this preferred method happen. So where can clients and patients get their prebiotics? Fortunately, prebiotics are naturally occurring in many plant foods, because they're components of nondigestible fibers. Many high-fiber foods also serve as prebiotics. Foods with high amounts of prebiotics include chicory, garlic, leeks, onion, asparagus, and Jerusalem artichokes (sunchokes). They're also found in lesser amounts in bananas, whole wheat, yams, and sweet potatoes. Since the adequate intake for prebiotics is undefined, a diet that includes a diverse variety of high-fiber fruits and vegetables, especially foods high in prebiotics, has the most potential for obtaining sufficient amounts. However, according to Sanders, people tend to bundle prebiotics and fiber. There's some logic to this, she says, since both are fermented in the gut. Yet, in order for a substance to be considered prebiotic, it must be selectively fermented by the good bacteria and not by the bad bacteria. This means it's important to focus specifically on increasing prebiotic-rich foods, not just fiber-rich options. Unfortunately, surveys have shown that most people don't eat enough dietary fiber each day and therefore aren't eating adequate amounts of prebiotics. "The average American eats just 15 g of fiber per day, yet the recommendation for adults is 25 to 38 g per day," Slavin says. Most people can benefit from increasing their fiber intake, including foods high in prebiotics. Patients with digestive disorders, such as IBS, bone health issues, and those managing their weight, especially may benefit from eating prebiotic-containing foods.7 Recommending clients and patients include these foods high in prebiotics is one step. In addition to food sources, RDs can recommend prebiotic supplements as part of medical nutrition therapy for specific conditions. It's important to consider a gradual increase in dietary fiber and prebiotics in particular, since research has shown that eating large amounts at one time may cause dietary distress such as bloating and flatulence.7 Clients should increase their fluid intake as they eat more fiber-rich foods to prevent gastrointestinal upset and constipation. However, prebiotics may not be for every client. 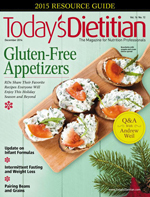 Kate Scarlata, RDN, LD, an author and private practitioner specializing in digestive disorders, expects prebiotic use to grow as health care professionals learn more about their benefits, but says they aren't appropriate for those on a low-FODMAP (fermentable oligo-, di-, and monosaccharides and polyols) diet. As in many other areas of nutrition, the science is evolving. As dietitians continue to learn about the microbiome and its effects on overall health and well-being, they should continue to learn more about how to use nutrition to influence this invisible ecosystem. 1. Hill C, Guarner F, Reid G, et al. The International Scientific Association for Probiotics and Prebiotics consensus statement on the scope and appropriate use of the term probiotic. Nat Rev Gasteroenterol Hepatol. 2014;11(8):506-514. 2. Gibson GR, Scott KP, Rastall RA, et al. Dietary prebiotics: current status and new definition. Food Science and Technology Bulletin: Functional Foods. 2010;7(1):1-19. 3. Anandharaj M, Sivasankari B, Parveen Rani R. Effects of probiotics, prebiotics, and synbiotics on hypercholesterolemia: a review. Chinese J Biol. 2014;1-7. 4. Holmes E, Li JV, Athanasiou T, Ashrafian H, Nicholson JK. Understanding the role of the gut microbiome—host metabolic signal disruption in health and disease. Trends Microbiol. 2011;19(7):349-359. 5. MacFarlane GT, Macfarlane S. Fermentation in the human large intestine: its physiologic consequences and the potential contribution of prebiotics. J Clin Gastroenterol. 2011;45 Suppl:S120-S127. 6. Brownawell AM, Caers W, Gibson GR, et al. Prebiotics and the health benefits of fiber: current regulatory status, research and goals. J Nutr. 2012;142(5):962-974. 7. Sanders ME, Lenoir-Wijnkoop I, Salminen S, et al. Probiotics and prebiotics: prospects for public health and nutritional recommendations. Ann N Y Acad Sci. 2014;1309:19-29.